With the supermarket fuel price war ongoing, Sainsbury’s has upped the ante by announcing it will be the first of them to sell hydrogen to motorists. Sainsburys will open a SmartFuel hydrogen forecourt at it Hendon store, London, before the end of 2014. 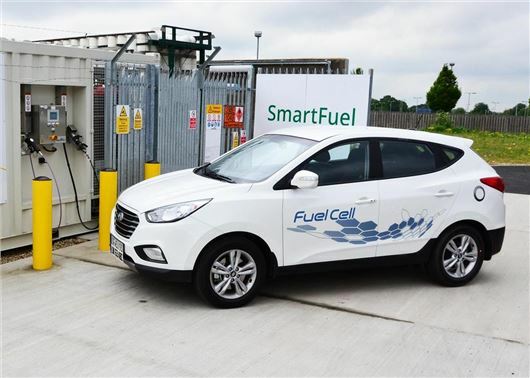 SmartFuel stations are owned and operated by Air Products, with the UK company forming a partnership with Sainsbury’s that it hopes will see a network of hydrogen fuel stations proliferate nationwide. "Making hydrogen technology available at a supermarket for the first time is another big step in encouraging the use of cleaner, greener fuels to reduce air pollution and protect the nation’s health,” said Diana Raine of Air Products. Accessibility at the new hydrogen pump is not likely to be a problem, however: according to the Society of Motor Manufacturers and Traders (SMMT), there are “less than ten” hydrogen passenger cars on the road in the UK today. But the Government hopes that by investing in a viable hydrogen infrastructure, the technology will have the chance to move from the embryonic stage that it has been stuck at since Honda unveiled the FCX Clarity in 2008. To that end, this month Westminster announced £7.5 million funding towards the establishment of a UK-wide hydrogen infrastructure, with a further £3.5 million secured from private equity. This £11 million total investment should fund up to seven new hydrogen fuel stations, although it’s an amount dwarfed by the Government’s financial pledge to the advancement of electric vehicle technology, which will be £500 million next year alone. Nonetheless, hydrogen vehicles are currently being developed by a clutch of major manufacturers including Honda, Nissan and Hyundai. The only by-produce of a hydrogen fuel cell car is water, and proponents argue that hydrogen reduces so-called ‘range anxiety’ because hydrogen cars can be re-fuelled in the same way a petrol or diesel car can. However, hydrogen is often produced using fossil fuels, denting its ‘well-to-wheel’ CO2 efficiency, and is problematic to store, requiring a pressurised fuel tank.